To celebrate the event the Scottish Chamber Orchestra have kindly given us a pair of tickets for the evening. Kinloch Anderson will add to this a £100 voucher to spend in store or online to the lucky winner. For your chance to win this wonderful evening out and a wee shopping spree please like us on Facebook and tell us in the comments section which of our day tweed kilt jackets goes best with the SCO Tartan and why. Designed by Kinloch Anderson, the Scottish Chamber Orchestra Tartan sett is based on the Ferguson, MacDonald and Maxwell clans, honouring the contributions of Sir Charles Mackerras, Donald MacDonald and Sir Peter Maxwell Davies to the SCO’s history. A number of products are available to purchase in the tartan at SCO events and on their website. Discover more about our Tartan Design Service. 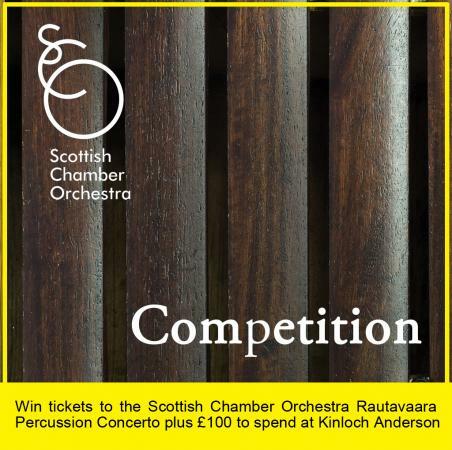 The prize is a pair of tickets to the SCO Rautavaara Percussion Concerto at The Queens Hall, Edinburgh on Thursday 1st March at 7.30 pm. plus a Kinloch Anderson voucher to the value £100. One winner will be selected, from qualified entrants. The competition opens on Friday 2nd Feburary 2018 and closes at 23:59 (GMT) on Friday 16th February 2018. No responsibility will be accepted for late entries. The winner will be selected by the Chief Executive of Kinloch Anderson Ltd. The winner will be contacted via Facebook. The Concerto tickets will be picked up at The Queens Hall, Edinburgh on the evening of the concert. The Kinloch Anderson gift voucher may be used in store or online. If the selected winner cannot be contacted within 7 days of the initial communication, Kinloch Anderson reserve the right to select another winner from the shortlist of entrants.